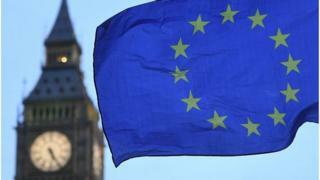 The UK government has said an implementation period will be needed to bed in the changes arising from Brexit but have ruled out staying in the single market after the UK leaves in March 2019. Prime Minister Theresa May wants discussions on trade and other post-Brexit matters to begin as soon as possible but EU leaders say this is dependent on progress on issues relating to the UK's withdrawal, including over the size of any so-called "divorce bill". While the UK's recent policy paper on the Irish border had been extensive, he said for progress to be made, both sides had to set out their intentions at the same pace. He warned there was increasing evidence that EU citizens in the UK and British citizens in the EU were being treated "like foreigners" which he said was against EU law while the UK was still a member. Mrs May says it is the UK making the running in talks, telling reporters on a visit to Japan on Wednesday that it was her government which was "coming forward with the ideas and the clarity about the future", both in terms of its post-Brexit relationship with the EU and its engagement with the rest of the world. In a BBC interview, she criticised Labour - which has shifted its position by calling for membership of the single market and the customs union to be retained for an unspecified transitional period. Mrs May said she remained confident a mutually beneficial Brexit deal could be done, with a "smooth changeover" for British businesses, consumers and foreign investors. Meanwhile, former foreign secretary Lord Hague has told the BBC the Conservatives' failure to win the general election outright will mean a "worse" Brexit deal. Mrs May's loss of her Commons majority had weakened her negotiating hand and the UK would pay a "bigger price" for leaving, he told Emma Barnett on BBC Radio 5 live Daily. While defending Mrs May's decision to call a snap election, the Tory peer said his party had run a "pretty poor" campaign and the prime minister was now in a "pretty difficult" situation, having to rely on the support of the Democratic Unionists to get Brexit bills and other legislation through Parliament. "I don't think calling the election was a mistake," he said. "I think the result was a mistake. Collectively, by the people of this country. "They (the EU) know that the result of the British election weakened the British government's negotiating position. It absolutely did. "So Britain will get a worse deal as a result of the election. I think there is no question about that." While he was not blaming the electorate for not giving one party an overall majority, he said the UK would pay "a bigger price for leaving, I think, because of the uncertainties of the election result".